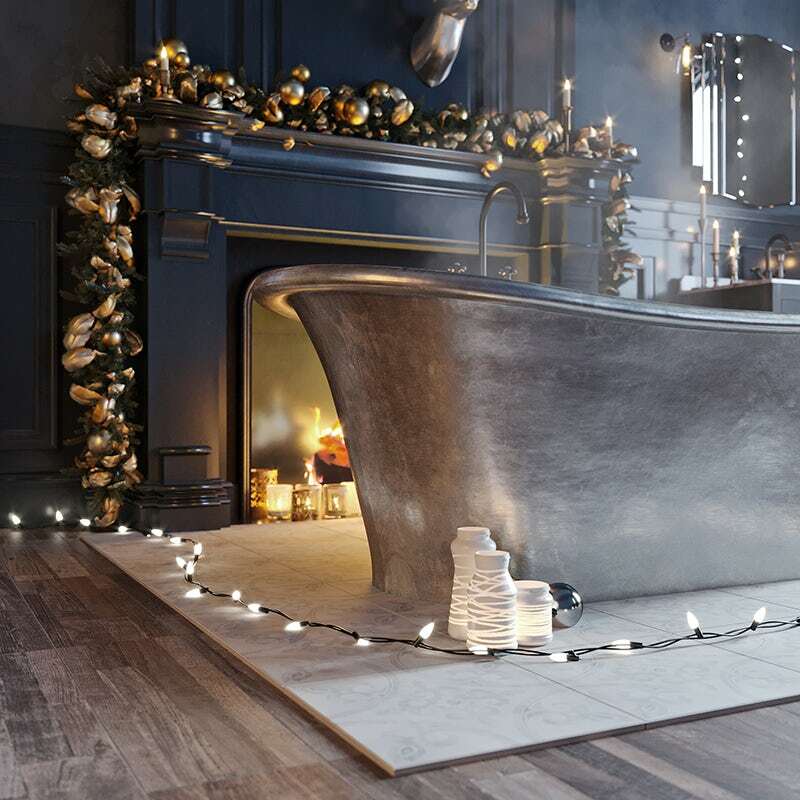 This week, it's all about those fabulous festive accessories, as I show you how to dress your Enchanted Winter bathroom in time for that most magical part of the year. In part 3 of this 4-part style guide, I'll be taking you through accessorising your Enchanted Winter bathroom, looking at the colours, materials, textures, lighting, heating and accessories you can use to make this a magical, fantasy interior. If you haven't done so already, why not head back to part 1, where I explain all about this look and the trends behind it, and then move onto part 2 where we discover how to create the look in a small bathroom space. One of the key elements of our Enchanted Winter bathroom is the use of darker shades to create a magical, mystical interior. Many people think darker colours will make their space feel cold and oppressive, however, by following a few tried and trusted techniques it simply isn’t the case. A method we’ve used in our Enchanted Winter bathroom is to pick a colour but use it in slightly different tones on different surfaces. This creates some subtle contrast and brings structure to the room, without the need to introduce a varied palette. You could also mix things up altering the way you apply paint to your different surfaces. For example, why not sponge on paint for an interesting effect (we’ve got a great video, here)? Make sure you choose specialist bathroom paint which features an anti-mould formula. Our Craig & Rose 1829 paint is perfect for this. So which colours should you go for? Whilst black, in moderation could be an option, we’ve opted for something a little lighter with a midnight blue. However, you could easily choose something that reflects your own personal tastes, like purple, ochre or green, as long as it is a dark shade. To add a touch of warmth to your space, add in some wood effect flooring, using either floor tiles or vinyl (Krono Xonic vinyl flooring is ideal for this purpose). Look for a colour that contains slightly darker elements, like browns and greys. Creating a more theatrical look to your setting will really help set the scene, allowing you to add lighter elements which appear to dazzle and twinkle against this moody backdrop. Darker interiors have begun to become more this year and we expect this trend to continue apace in 2019. Take a look at shop interiors and hotels and you may notice this trend emerging even there. 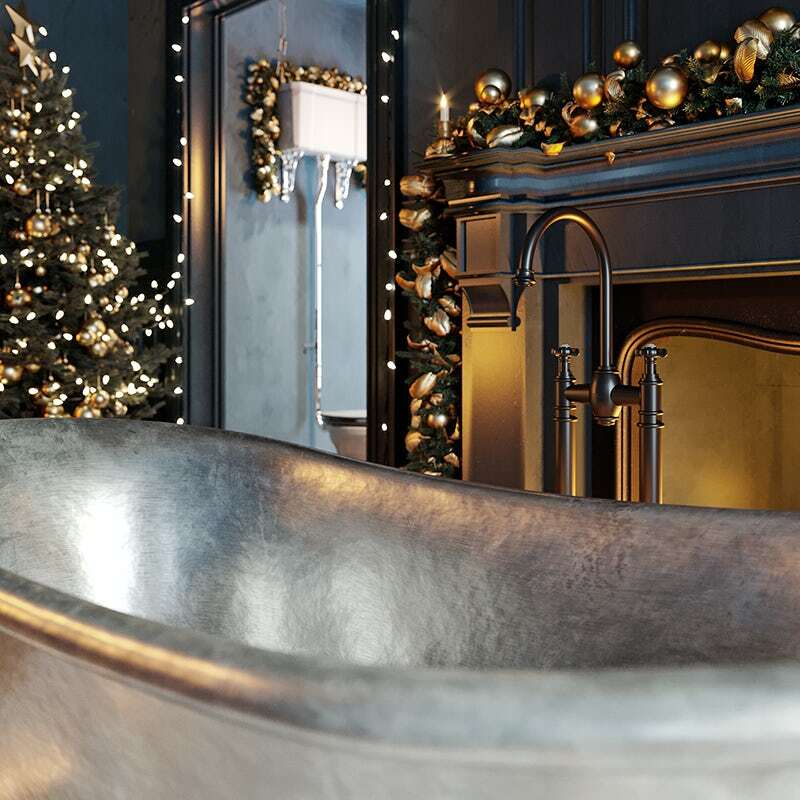 Another theme that runs through our Enchanted Winter bathroom is tradition. Christmas is the time of the year when our customs and traditions are at their most obvious (whether it’s bringing a tree into the house, or hanging some mistletoe above your door), so it’s good to look for more traditional materials and textures when picking out products. For example, the bath we chose is made from tin, harking back to a time when baths were hung up and filled from the stove for the evening bath. The washstand also uses more traditional materials, with a gorgeous smooth marble countertop and solid oak wood. Black finish taps, showers and fixings can also lend a slightly industrial feel to your overall design. Your choice of accessories can be split between those which will remain permanent throughout the year and those which will be in place exclusively during the festive season. Scented candles—to aid relaxation and create the perfect ambience. 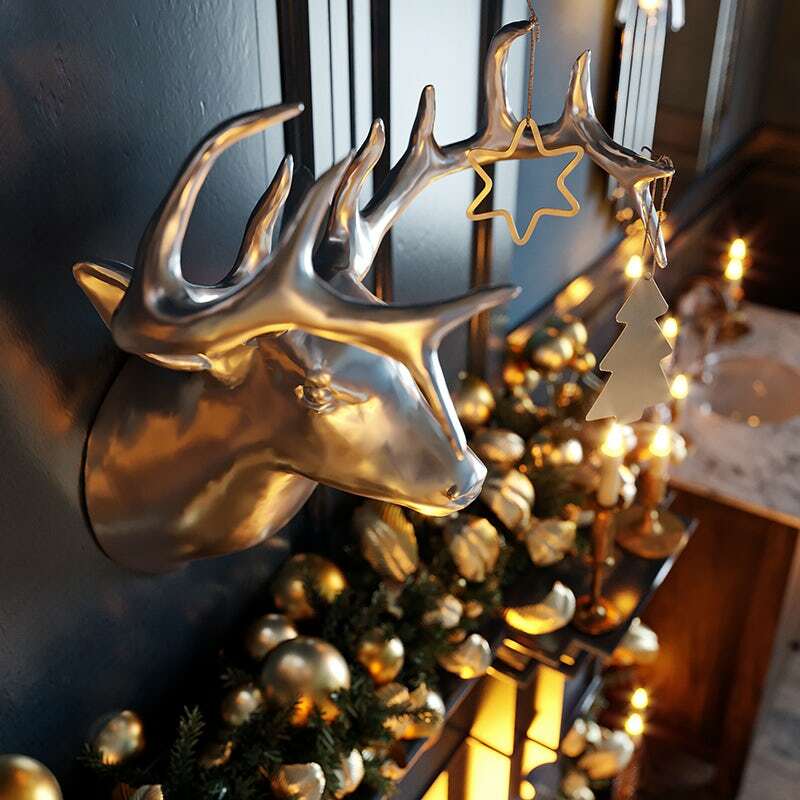 Wall ornaments—we’ve gone for some stag heads in gold to evoke a sense of winter wildlife but yours could obviously be something very different. A classic wall mirror—look for something with a more traditional edge, like the Art Deco-inspired mirror we chose. Wall lamps—placed either side of your mirror, they can function both as task and mood lighting. Traditional heating—a floor mounted heated towel rail in classic chrome will give you handy place to warm those towels. Go for gold—gold decorations add a certain warmth and class to your overall look, working better than greens or reds. Fairy lights—some white bulbs trailed around your door frame or around the edge of your room can add a festive flavour (make sure they are suitable for use in your bathroom). Wreaths and garlands—if possible, add a touch of greenery in the form of a festive wreath or garland. Gift sets—provide the perfect setting for any festive guest with their very own Baylis & Harding bath gift set. Well, it is Christmas, after all!